Maybe you’re tired of grotting away at the lab bench. Or finding it hard to get a tenured job. Perhaps your last paper was rejected and you haven’t the spirit to fight back. Do not despair. There is an alternative. The media are always on the look-out for a scientist who will fearlessly speak out and generate newsworthy stories. You can gain kudos as an expert, even if if you haven't got much of a track record in the subject, by following a few simple rules. Rule #1. Establish your credentials. You need to have lots of letters after your name. It doesn’t really matter what they mean, so long as they sound impressive. It’s also good to be a fellow of some kind of Royal Society. Some of these are rather snooty and appoint fellows by an exclusive election process, but it’s a little known fact that others require little more than a minimal indication of academic standing and will admit you to the fellowship provided you fill in a form and agree to pay an annual subscription. So sign up as a Fellow of the Royal Society of Medicine, and keep good company with a range of naturopaths, homeopaths and chiropracters who have discovered this easy route to eminence. The really nice thing is that even academics can be hoodwinked by this one. Rule #2. Find a controversial topic. This is key. You have to be willing to take a definite position on something that people have strong views about. A scare story is good - we’ve all been doing X for years but it could damage us. Finding someone to blame is also good - people who do Y are feckless. And the buzz word of the decade is neuroscience, so if you can work that in, success is guaranteed. If you're short of ideas, the list of the right might help inspire you. A recent article in the Biologist hits the spot with “The biological effects of day care”, managing to get us worried about an everyday activity, blame working mothers, and get in a neuro message all at once. It's even spiced up with a bit of conspiracy theory: experts know that day care is bad for children’s brains but nobody is allowed to speak out because it is too politically sensitive. This presses so many buttons that few journalists could resist the story. The point here is that if you can usually find at least some studies that provide evidence for bits of the causal chain. Although it may be inconvenient if, as in this case, studies looking for a link between A and D fail to come up with clear evidence (Lucas-Thompson et al, 2010), you can rely on two things: first, few readers will be familiar with the research literature, so they will only know as much as you tell them. And second, step C, brain abnormality, is highly salient and once you start talking about that, it will distract attention from the other levels of description. Rule #4. Avoid rigorous peer review. You don’t want to have your views critiqued by someone who knows the literature, or checks your sources. Writing books is a safe bet for avoiding pre-publication scientific critique. As far as journals go, the Biologist is ideal. This publication for the members of the Society of Biology claims to be peer-reviewed, but, as we shall see, the review process is far from rigorous. Rule #5. Assemble supportive evidence. Note, it is important not to present all relevant studies, just those with findings that can be fitted into the causal chain. Sigman avoids mentioning any of this and turns instead to look at the links between cortisol levels and ill health, starting with studies that show a link between cortisol and cardiovascular disease. He does not explain that these were done on people aged over 65 years, but rather implants in people’s minds the notion that this is relevant for his arguments about daycare in toddlers. Next comes the serious stuff: research linking elevated cortisol to the brain. We are told that “Cortisol is considered neurotoxic and has a global impact on cerebral size (e.g. McEwen 2007; Sheline 2003).” (p. 29). 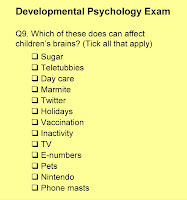 Again, we are left with the distinct impression that children who attend day care will have small brains, but to find out what actually is meant here we need to read the cited articles. When we do, we find that McEwen (2007) is a thorough research review of the physiology and neurobiology of stress and adaptation that nowhere mentions the terms ‘neurotoxic’, ‘global’ or ‘cerebral size’. Rather, in this article McEwen develops a complex theory that considers both positive and negative impact of stress. It actually has a section subtitled “Protection and damage: the two sides of the response to stressors” which discusses animal studies demonstrating how elevated cortisol can either improve or interfere with brain function, depending on context. Neurotoxicity does feature in the other article, by Sheline (2003), but this is concerned with mood disorders in adults, and discusses effects of hypercortisolemia, a condition where there is chronic elevation of cortisol, rather than a temporary increase at specific times of day. Subsequent citations are to papers that considered the role of cortisol in psychiatric disorders such as anxiety and depression: note that now the evidence is focused on a link between cortisol and adult psychiatric disorders in the opposite direction (from D to B), yet it is presented in the context of discussing consequences of high cortisol in children who attended day care. Sigman further states: “a higher cortisol awakening curve may be a biological marker for an underlying disposition towards developing depressive and anxiety disorders” (p. 30), even though the studies of toddlers attending day care show a cortisol response that develops through the day, rather than a chronically raised level: see Vermeer and van IJzendoorn (2006) for a well-balanced discussion of such evidence. I’m not an expert in the neurobiology of stress. I can track down articles that appear to have been cited by Sigman (the reference list is behind a paywall) and see where he's given a misleading account, but what I don’t know is how much relevant literature has been omitted. This, of course, is what the celebrity scientist can rely on: there's only a handful of people who both have the expertise in the area, and are obsessive enough to trawl through your writing (if they can access it) and challenge any misleading statements. Rule #6. Anticipate criticism but don't let it worry you. People who actually do research in the area you are reviewing may get irritated, but most scientists in the field wouldn’t bother on the grounds that they don't know who you are, and aren’t interested in pursuing academic debates outside the domain of mainstream journals. The worst you may get is a few nerdy bloggers such as Gimpy or Mind Hacks criticising you for lack of scholarship, sensationalism and cherrypicking of evidence. Or, if you're really unlucky, you might be up against Ben Goldacre on Newsnight. But meanwhile, your purpose as celebrity scientist has been achieved: your views are all over the media. Sigman, A. (2011). Mother superior? The biological effects of day care. The Biologist, 5 (3), 29-32. May not be a good link from daycare to later problems directly, but the way in which the cortisol process is developed in the body is incontrovertible. Try reading Sue Gerhardt's "Why Love Matters" - which explains a broad swathe of modern neurochemical research. It does NOT refer to daycare - it refers to the care an infant receives in the first 18 months of life. Please don't denigrate the basic research because it's used to come to conclusions concerning daycare that weren't there in the original work. Blasphemy! 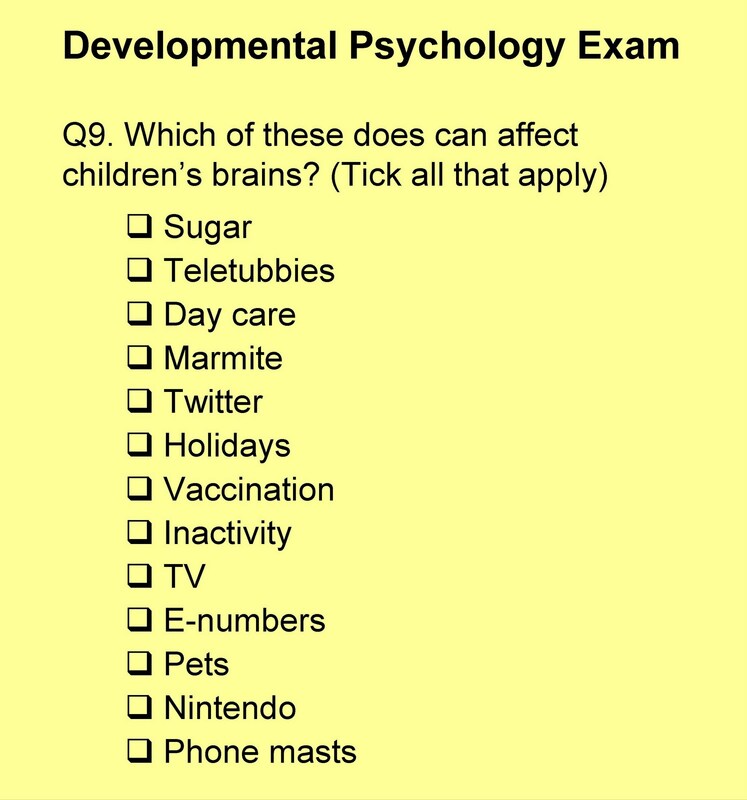 Marmite-serving day care centers built beside phone masts are destroying our children's brains. You are clearly in the pocket of big-pharma, pro-vaccine war-mongers. Only homeopaths can save us all. @Anonymous – I think you've misunderstood the post entirely. The blogger is denigrating Sigman's work for (seemingly wilfully) misconstruing the existing evidence and citing the basic research completely inappropriately. In your last sentence, you write "views" but I think you mean "name". Great stuff. This is what the New World Order doesn't want people to know about! This is extremely irresponsible, and the reason it's so hard to change public perceptions about outdated media scares and principals of statistics. I'm sure you meant the post to be satirical, but it hits so close to home that it just makes me sad. well, call me cycnical, but this seems to me to be politically motivated - we are in the middle of recession, unemployment is going through the roof and the government have no money so can't keep paying out all the financial benefits to mothers who work. How to get them out of work and "back where they belong"? Tell them chid care is bad for their kids!! I mean, argh, nothing. I don't use the internet, I just point to it. * If you don't have any cortisol, you don't become really chilled out and brainy. You get sick and eventually die. That's called Addison's disease. It's no fun. JFK had it, he had to take cortisol for life to treat it. * If you inject someone with cortisol, they usually enjoy it. It doesn't make you feel stressed, it makes you feel energized. There's a theory actually that JFK took too much cortisol and it made him hyperactive. I was talking to a well-known neuroscientist at a conference once who become effectively manic as a result of excessive cortisol levels caused by Cushing's disease. * Physical exercise - the healthiest thing since sliced bread - raises cortisol, at least in the short term. Institutional Daycare for Babies and Toddlers is far from being harmless, starting with the simple fact that young children DO NOT WANT to be seperated from their primary attachment figures (usually parents) for hours. For them it´s even worse, because they have no sense of time: They feel alone and helpless in a span of a subjective eternity (on a daily basis!). That´s what their cortisol level reflect, an it isn´t in the least harmless. It´s not fair to parents either because they are robbed of a great portion of time of the most precious and heartwarming relationship. Parents should get paid for their family educational work. The effects of group daycare on the individual kid might be small, the society-impact is nonetheless dubious. Do we really want to push more risk-taking and more impulsivity? And just look at the rising number of psychiatric cases in Western Societies! Swedish parents have begun to realize all this. Sweden is on the way to re-install support for more family life - for more mental health and emotional wellbeing. Dorothea: do you have any references to peer-reviewed research to support your claims? I think Aric Sigman would be very grateful for them, as he's rather short of evidence. Thanks for sharing this important informations. I know there was a study decades ago (forgot who it was by) but it was to do with maternal deprivation in the first six years of Polish orphanage who experienced "maternal deprivation". Compared with English children who did not. Children who were more than six months at the time suffering the deprivation were found to be a bit withdrawn and possessed poor social skills. Forgot who it was by. Thanks for the article can make me find what im searching !